Gym is located behind school and church. From Clifton Ave turn on side street called Resor Avenue to find entrance to the gym parking lot. Look for Father Klug Center. Entrance located directly in the middle of the long stretch of parking in front of the school. Gym entrance is on left side of main building in the corner. SOUTH GYM: Enter campus using either north or south driveway. South Gym is in the main academic building. Enter the building through the set of three glass doors and the south gym entrance is across from dining terrace. NORTH GYM: Enter campus through the north driveway behind academic building. The Leonard Athletic Center is straight ahead. North Gym and Swimming Pool are on the lower levels. Gymnastics room is on the upper level with the stairs in the main lobby. Entrance to the gym is located in the back of the building. This facility has a "Big Gym" and a "Small Gym"
The North Gym is directly in front of you when you walk in front doors. Please follow the hallway to the right to find the South Gym. Please use the side door to the school for entrance into the gym. The side door is located between the parking lot & Kindergarten Play Ground. The Main Entrance to the school is not open. The Greene Intermediate school contains two gymnasiums. Please enter on the front left side of the building by the cafeteria. The "front" gym will be directly in front of you and the "back" gym is at the end of the hallway. Restrooms are available in the hallway adjacent to the back gym. The Gregory Center is a building on the Sycamore High School campus which contains two full size auxiliary gyms and a fitness center. The building is on the north side of the school property (adjacent to the interstate) and is best accessed by the parking lot on the west side of the Sycamore High School property. Park on the back side of the building near Athletic Fields for Gym Entrance. This facility contains two gymnasiums, the main gym and the auxiliary (aux) gym. The entrance to the building is on the left hand side, facing the building (east-side). The entrance to the school is located on McMillan which is the "side" of the traditional building. The "Krueck" (name of the gym) entrance is the first driveway on McMillan that you see on the right hand side if you are traveling West on McMillan. There are 3 entrances to the Indian Hill High School/Middle School complex on Drake Rd. Please enter the complex using the northern-most driveway (farthest from Shawnee Run Rd). The entrance to the high school gymnasium is in the bus circle adjacent to the south-west corner of the large parking lot. The Middle School and the High School are part of the same complex on Drake Rd. 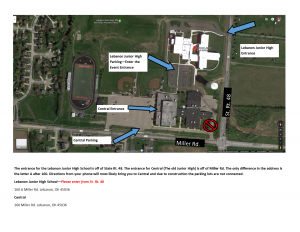 There are 3 entrances to the complex, please use the southern-most entrance (closest to Shawnee Run Rd). There is a sign adjacent to the entrance that says "Indian Hill Middle School". Upon entering the southern-most driveway, there is a parking lot directly to the right. The gym entrance is the second door on the left side of the facility as you face the front of the building. The gym entrance is behind the school on the right hand side of the facility as you face the front of the building. Please enter through the side entrance on the north side of the school. Also, please note that per league policy, the gym will not open until 30 minutes before the first game of the day and is set to unlock automatically based on a timer. Please don't expect to gain entrance earlier than 30 minutes before the first game of the day. Thanks! Parking lot is located in rear of building at corner of West St. and Madisonville Rd. 4/5 Building is to the right as you enter the campus - the entrance is at the end of the building nearest the youth football field. This is the high school gym. Enter the main High School entrance and take the first left when entering the atrium. Enter in the back of the school. The driveway to the gym entrance is right beside Sturbridge Rd. Above the door to the gym entrance it says YAVNEH DAY SCHOOL-SHENK HALL. The main gym can be most easily accessed via the top parking lot, driveway off Creek Road. The old gym can be most easily accessed via the bottom parking lot, driveway off Thornview Drive. There are no concessions and ABSOLUTELY NO food or drink other than water allowed in the main gym. Sycamore Junior High School is located in Blue Ash, OH on Cooper Rd in between Kenwood Rd and Montgomery Rd. The gyms are best accessible from the parking lot on the east side of the building. The main gym is the feature floor for all Sycamore Junior High School basketball teams and contains elevated seating. The back gym is located further down the hallway on the right. Gyms are located at each of the following schools on the campus: High School (competitive gym), Middle School (auxiliary gym), and Elementary School (Ken Neyer Sr. gym). You can access all of our gyms by entering The Event Entrance. The Event Entrance doors will be the only doors unlocked. Located behind Jungle Jims. The gym is on the left side of the Admin Building, lower level.